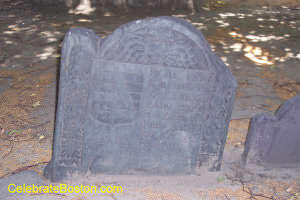 King's Chapel Burying Ground is located at Tremont and School Streets in Downtown Boston. The cemetery is the final resting place of Puritan Governor John Winthrop and Reverend John Cotton. The graveyard dates back to the earliest days of the colony (1630). In about 1810, the Superintendent of Burials moved most of the headstones, and laid them out into neat rows. A few decades later, the markers in the center of the graveyard were also moved. Respect for the dead was not the highest priority for many years after the Revolution. An old legend was that moving the headstones confused the spirits, and have ever since endlessly wandered around looking for their graves. For those who believe in ghosts, one can speculate whether restless spirits remain at King's Chapel Burying Ground. There are two legends associated with the graveyard. The first story is that of an African-American woman who died. A careless carpenter built her coffin too short, and to conceal his blunder, had severed the head of her body, and placed it between her legs to take up less space. The coffin was nailed shut, and she was buried this way. "Some old woman was certain, that a person, lately buried, was not exactly dead. She gave utterance to this certainty—there was no evidence, and ample room therefore for faith. The defunct had a little property—it was a clear case, of course—[that] his relatives had buried him alive, to get possession! A mob gathered, in King's Chapel yard; and, to appease their righteous indignation, the grave was opened, the body exposed, doctors examined, and the mob was respectfully assured, that the man was dead—dead as a door nail. A proposition to bury the old woman, in revenge, was rejected immediately. But she did not give up the point—they never do. She admitted, that the party was dead, but persisted, that his death was caused, by being buried alive." Burying people alive by mistake occurred occasionally until modern times. The November 6, 1874 Boston Globe describes such an event in Montreal: "A horrible case of a person being buried alive has just come to light. A women who died suddenly was about being re-interred in a Roman Catholic cemetery, last Friday, when a near relative arrived from a distance and desired to see her face. On opening the coffin, the body was found to have turned on its side. The woman in her struggles had bitten her arm and torn the grave clothes. Her face bore the expression of unutterable agony." This editor has experienced one strange incident at the burying ground. After making about 20 digital videos at the cemetery on one visit, I reviewed the videos on the flash card. On my 2nd inspection, half the videos were missing. The flash card was replaced immediately, and software was later used to see what videos were recoverable. Well, the videos from that day, and unrelated videos from the previous week that had been deleted, were recovered from the card, but those 10 videos had vanished! They were filmed along the path parallel to the church. Even though this editor does not believe in spirits, I pondered at that time if Elizabeth Pain was asking for me to clear her name: Nathaniel Hawthorne had used her headstone and not her life—as inspiration for the Scarlet Letter.